You may only want one copy of The Red Solstice but those pesky developers are forcing, yes forcing, you to get two copies at a heavily discounted price. Due to an error in Steam’s listings, the double pack edition of Red Solstice has gone up at the price of a single copy. On top of that it was having a 40% off sale this weekend. Meaning you can get two copies of the tactical co-op survival game for just £11.40. Developers Ironward have been in contact to say they’ll have the listing issue solved tomorrow but they’re happy for people to take advantage of their misfortune till then. The upside of this is that there are lots of players online, which is an ideal situation for an indie multiplayer title. Dan Marshall from Size Five wrote about the difficulties of empty servers for indies not too long ago. Originally funded through Kickstarter, The Red Solstice sends you into the future on the surface of Mars. A solar storm has ripped across the planet and all communication with the capital colony, Tharsis, have been lost. With the storm still ongoing it’s on you to investigate what’s happening in the capital. 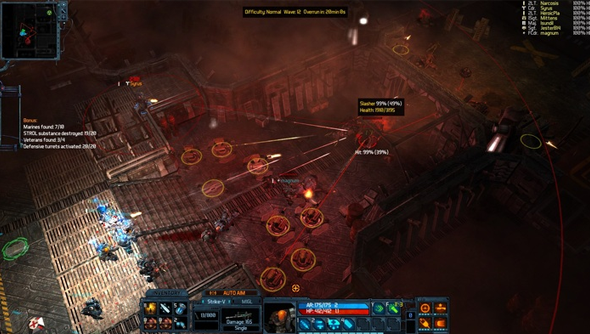 Taking Syndicate and Dawn of War as an inspiration, you’ll control squads of space marines against an alien menace. We were a little disappointed with Full Control’s remake of Space Hulk, which promised squad-based space marine on alien action and delivered a clunky, stale, board game adaptation. Red Solstice looks to work where Space Hulk failed. There’s a link to download a demo over on the Kickstarter page or you can take advantage of this deal and get two copies of Red Solstice on the cheap.